On Monday, his spokesman Salvador Panelo said Duterte, just like the previous Malacanang occupants, could pitch for public support his chosen Senate bets. 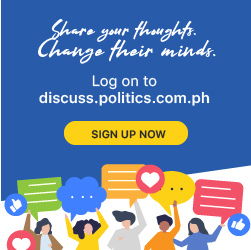 “The President under the law can campaign for or against candidates by reason of the provision under the law that political or officials by reason of their political offices can campaign,” Panelo said in a media interview. To date, Duterte, in separate speaking engagements, has endorsed 10 senatorial candidates. They are Senators Joseph Victor Ejercito, Cynthia Villar, and Juan Edgardo Angara, Taguig Rep. Pia Cayetano, Ilocos Norte Governor Imee Marcos, former senator Jinggoy Estrada, former Philippine National Police chief Ronald Dela Rosa, former presidential adviser on political affairs Francis Tolentino, former special assistant to the president Christopher Go, folk singer Freddie Aguilar.